This cafe knocked my socks off. I’ve never had so much fun in a coffee shop. Though that may well have been the company. Bean Drinking on Ernest Place in Crows Nest is the happy owner of Slayer Espresso Machine #007. 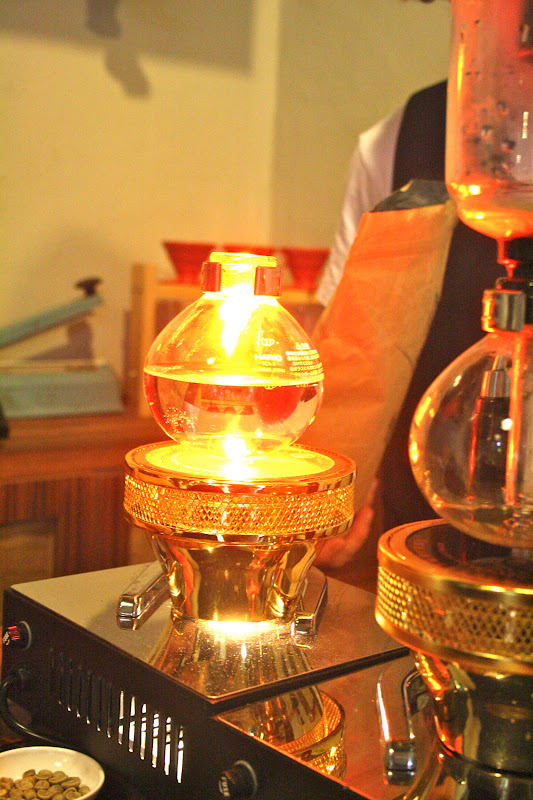 They use it in their “Coffee Lab” rather than as their stock standard machine. 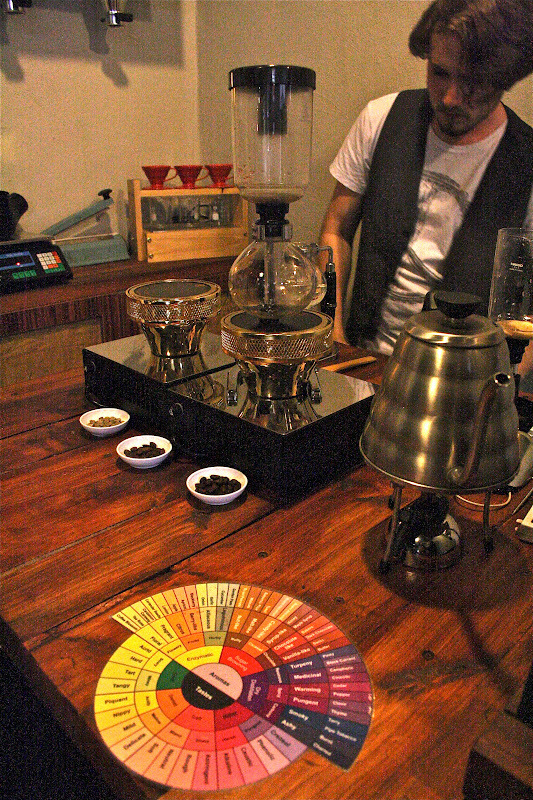 Today they were pouring Yirgacheffe shots with the Slayer. One of my favourite beans, and the machine did it justice. I would have licked the cup. Full of fruitiness and citrus. Sparkling. 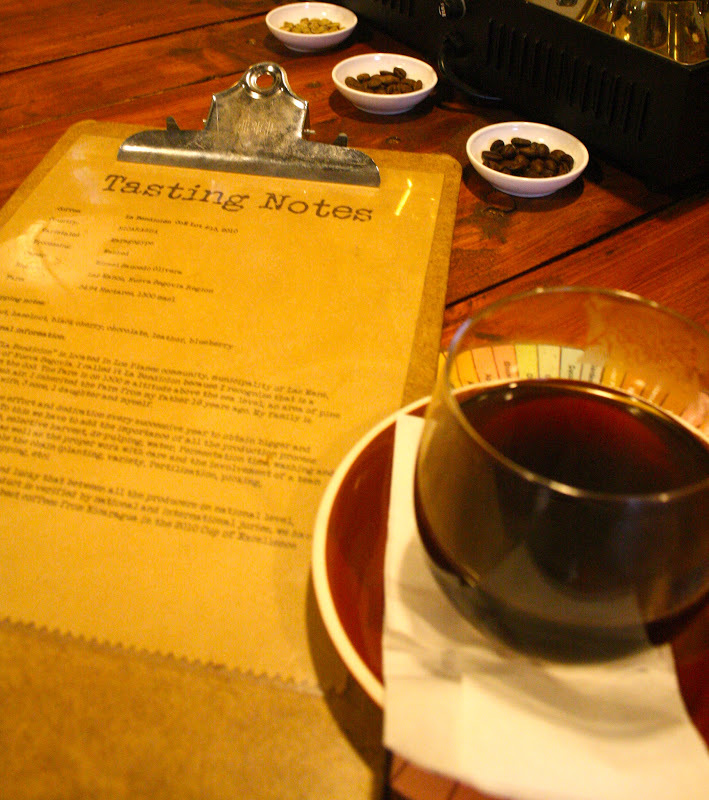 The Coffee Lab is a great feature – they offer the Coffee Flight Test – three different brew methods, using different coffees, for $12. 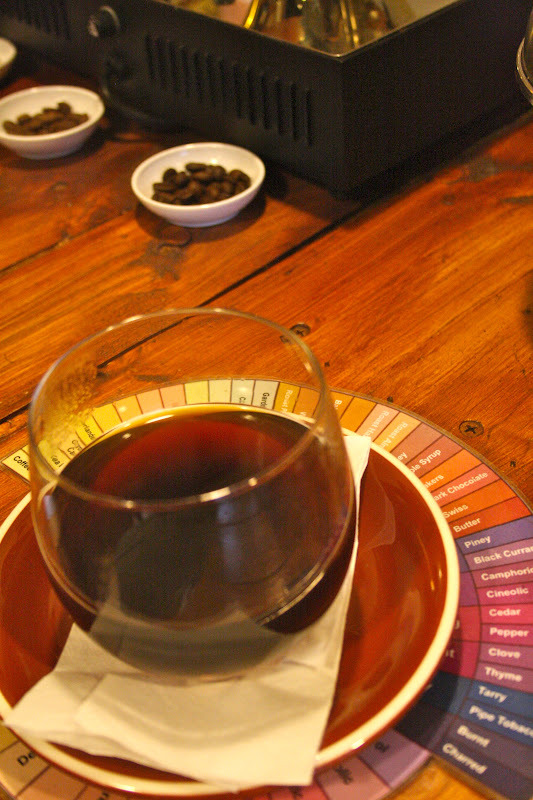 My only gripe, and it’s not significant, is that two of the methods I chose used the same Nicaraguan Cup of Excellence bean – who complains about that sort of thing? Not me. Not really. But I probably would have chosen something else had I thought about it, just for something a little different. I started my flight test with the syphon, lovely chocolatey notes with a strong and complex mix of fruit in the aroma and the mouth. Next up was the cold press with sparkling mineral water. Which was effervescent and amazing. A light roasted Tanzanian bean. I highly recommend the sparkling effect. It was so refreshing. 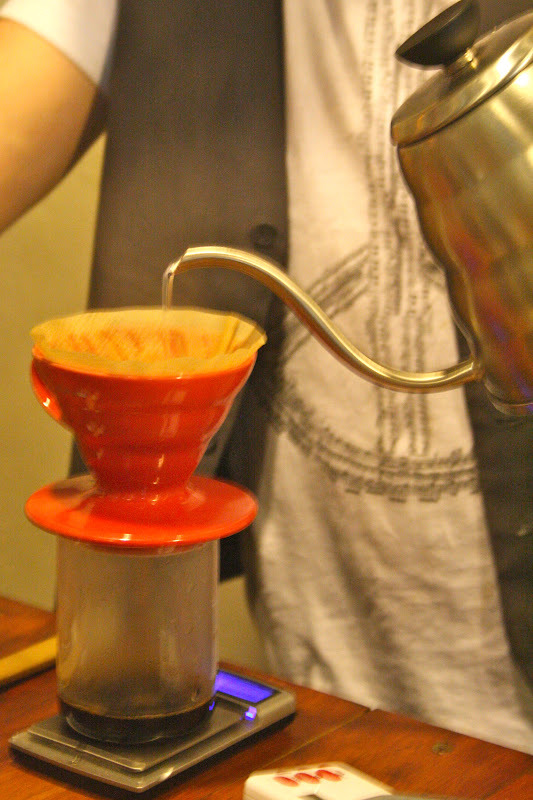 Finally, it was the pourover, which tasted quite a bit like the syphon, but was probably a little clearer, and was certainly fruitier on the nose. 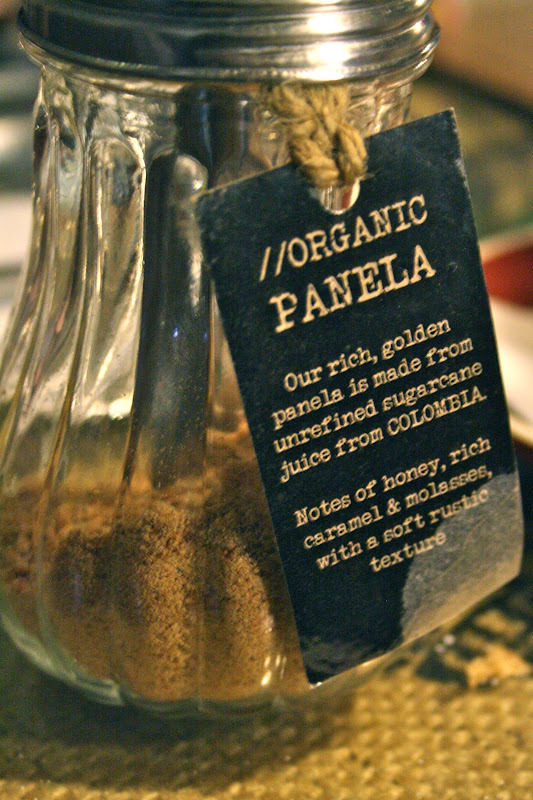 I love that these guys recognise that good coffee is both art and science – and they hit up both with equal measure. Such a delight. My biggest disappointment was that after having these four coffees I didn’t get any of the house blend milk based drinks my coffeepanions were enjoying. But, happily, the staff pulled some strings (they don’t normally sell the blend as a retail bean) and sold me 250gm to try at home. The customer service was just sensational. Not only were the baristas obviously excited about coffee and their work, they were aiming to please, and right on target. When they asked my friend Paul if he’d enjoyed his flat white, and his comment was it was a little too milky but otherwise pretty good, they served up another, on the house, with a slightly longer pour. It hit the spot. And this sort of ability to meet a customer’s taste, and to do it without any complaint but just to please, was just sensational. We spent about two and a half hours in store. I loved everything. The vibe. The coffee sack decor (framed on the wall, sewed together as cushions on the couches, covered in glass on the coffee table. The chalkboard diagrams of brew methods and roast profiles. Such a great aesthetic. Probably my favourite cafe in the world. So far. And I didn’t even drink my standard double shot flat white. Their food range is also pretty sensational and I enjoyed one of the best almond croissants I’ve ever eaten with my shot of yirgacheffe. You can follow Bean Drinking on Twitter. On the whole, Sydney has been a little hit and miss coffee wise. I had such high expectations (though still have two serious contenders to check out) – but I’d say, per capita, that Brisbane is a little ahead of the game. That said, these guys live up the Beanhunter hype, and they are well worth travelling for.